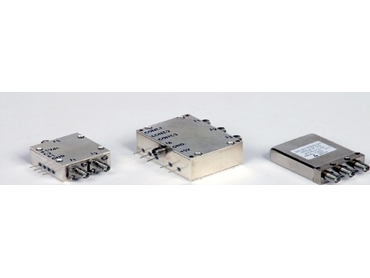 JFW Industries has over 1,600 different models of solid-state and relay RF switches. While JFW specialises in low and high power PIN diode switches, a complete line of electro-mechanical coaxial switches is also available. JFW RF switches feature switching configurations from 1P1T to 1P32T, frequency bands from 100kHz to 5GHz, Input power from 1 milliwatt to 1000 Watts and TTL interface. The switches also exhibit high isolation (up to 70dB) and fast switching speed (down to 5 microseconds). Custom features available include package configurations, Fail-safe and latching models, indicator circuitry and a range of different connector types. Solid-state and relay RF switches are available from RFI Industries .